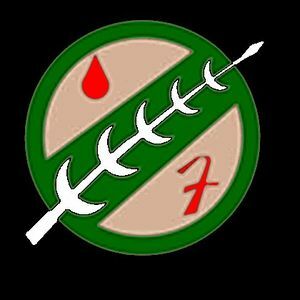 The Mandalorian Guild is a nomadic clan made up of warriors with various backgrounds. Family is not defined by blood but rather by our common culture. We do not necessarily align ourselves toward good or evil, we migrate to where the most money is to be made. We welcome all members without concern of gender, species, background, race, age, etc. as long as members are willing to abide by the Resol'nare, or Six Actions, central to the tenets of Mandalorian life. The Resol'nare consists of wearing beskar'gam (armor), speaking mando'a (the language), defending yourself and your family, raising your sons and daughters as Mandalorians, contributing to the clan's welfare, and when called upon by the Mand'alor (leader), rallying to his cause. 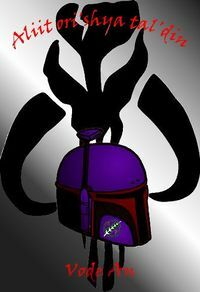 If you desire your hero/heroine to become a member of our family of warriors, simply tell them join the "Mandalorian" guild. For best chance of success, send the command while your hero is "outside of town" and being idle (i.e. not fighting a monster). Do NOT cancel your current quest first. 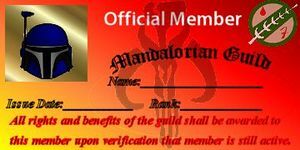 Once they finish their special quest, they will be brought into the guild as a fellow brother/sister Mandalorian with all rights and benefits of the guild shared with them. Welcome, ner vod (my brother/sister). Mandalorians in general are fierce warriors. The men as well as the women will fight when the need arises. Children, both boys and girls, are taught how to fight at a very young age. Being a Mandalorian warrior does not dictate that we are evil or shed blood unnecessarily. Several of our brothers and sisters are accomplished healers, inventors and farmers. However, all Mandalorians will come to arms when the need arises. Family does not necessarily mean a blood relationship. It is not unusual for the children of a fallen Mandalorian warrior to be adopted by another Mandalorian and raised as his/her own child. Fellow male warriors are referred to as brothers and female warriors as sisters. This is where the Mandalorian phrase "Vode An" (Brothers/Sisters All) comes from. The god RogueSaber 庙畜(U • C • T) sent his heroine Tahiri to Godville in search of bounties. After several months of successfully claiming bounties and clearing the nearby area of monsters, the citizens of Godville welcomed her with open arms and pleaded for her to remain. Tahiri prayed to her god to allow her to remain, and in return she would work towards building a temple in his name for worship. She would continue to claim bounties and slay the monsters terrorizing the area. RogueSaber was moved by her request and allowed Tahiri to remain. He created the Mandalorian Guild for her to call home and to recruit other warriors to help in her quests. Fellow Mandalorians are to be treated with respect at all times. We may be warriors, but infighting is strongly discouraged. As Mandalorians, we are all family whether blood related or not. "Aliit ori'shya tal'din" (Family is more than blood). The stronger, more experienced warriors must be willing to help out the lesser experienced members to grow stronger and gain more experience. This benefits everyone in the guild and the guild itself becomes stronger as a whole. Remember, we were all new at one time and only help and experience allowed us to become stronger. 1. Every opponent is fair game in the arena. This means there are no restrictions against battling against a fellow Mandalorian. Arena battles between Mandalorians and non-Mandalorians allow each warrior to prove his/her worth, increase skill and raise experience. 2. Mandalorians do not forfeit. Forfeiture is a sign of weakness. We will fight to the death before we will show signs of weakness. 3. You may use Voice Commands (VC) as you see fit. However, use of profanity is looked down upon. 4. You may use Encouragement and Punishment in any manner you prefer. 5. Gods may also choose to simply stand aside and allow their hero/heroine to battle it out on their own. This is acceptable for it allows the god to see how well their hero/heroine is able to fare in unaided battle. Sparring duels are encouraged and allow gods to achieve their Coaching Achievements. The same rules for Arena Etiquette should be followed while sparring. As with other guilds, the Mandalorian Guild incorporates a Guild Council chat. This is a conference chat that allows information to instantaneously be sent to all current members of the guild; no matter where they may be currently dispersed. Members can introduce themselves, ask questions, submit information, send warnings, announce special occasions (e.g. birthdays, new pet, temple completion, etc. ), chat, etc. The Guild Council is accessible to ALL members in your Friends section under "Invite a friend". This page was last edited on 9 January 2015, at 03:02.